The Old Leopard, as photographed by John M and posted on Geograph. There’s some interesting stuff going on over at Julian Ward-Davies’ Stonnall Local History Group on Facebook. Julian has spotted something also noticed in passing by reader and local history ferret [Howmuch? ]: there appear to have been two pubs called The Leopard in the Sandhills area – The Leopard and the Old Leopard. Most locals are familiar with the location of The Old leopard, for it’s existence is recorded on a plaque on the front of the house it used to exist within. The Leopard, however, is somewhat more elusive. References to the pubs of Sandhills and Stonnall, early 19th century. There we have it. There were two pubs at Sandhills. I think one point can be determined from this. The ‘T’ shaped building, mentioned in Gordon’s article and which was known to have been a former pub, must have been the Harp and not the Swan as I had previously thought. Also, an interesting question arises. Was Charles Glover of the Swan related to the Glover family of 20th century Stonnall? I’m interested in this, and I think it’s worth throwing out to see what the wider community here think. There seems to be scant evidence for The Leopard – although it clearly did exist, as it was listed above, but it’s location and nature are proving elusive. One of the biggest supporting facts for the existence of The Leopard is that the Old Leopard is called just that, implying a new one coming afterward; the etymology here is quite clear. What find quite curious is the two pubs being so similarly named, and one just seeming to vanish.Does anyone have any more information? A William Adkins aged 50 and wife Elizabeth 50 show living in Brewood in 1841 census. Not shown in Sandhills or Shenstone. A William Atkins(the same?) transported and 7 years at Stafford Court in 1850. A John Titterton aged 60 in Shenstone (rest blurred! )in1841 census… possibly shopkeeper, with wife Mary aged 70. Julian Ward-Davies Thanks David Evans. A very good contribution. David Evans Atkins= housebreaking and larceny. Graeme Fisher There’s a William Adkins listed on the tithe map owning a pub in the Shire Oaks area, plot A98, which may well be in Leopard country. David Evans A98 plot now has Leopard and x2 pairs late Vic cottages..Did these replace building in Tithe map (the Old Leopard) possibly? Their deeds may have reference. Julian Ward-Davies The A98 Tithe plot was the Leopard. The Old Leopard was not marked. It must have been nearby, but that doesn’t mean that it was in the Parish of Shenstone. Julian Ward-Davies That is interesting. Julian Ward-Davies Steve’s 1902 map marks it as the Leopard. Julian Ward-Davies Anyway, the point is there were two pubs and we still don’t seem to know where the other one was. David Evans present no 138 had a building on the site long time ago..pig farm or small-holding. A possibility? So, what do we know? If you’ve got anything further to add, comment here, or at the Stonnall Local History Group on Facebook or mail me at BrownhillsBob at Googlemail dot com. It would be nice to crack this one. This entry was posted in Brownhills stuff, Features, Followups, Fun stuff to see and do, Interesting photos, Local Blogs, Local History, Local media, Reader enquiries, Shared media, Shared memories, Social Media, Spotted whilst browsing the web, Walsall community, Walsall Wood stuff and tagged Brownhills, Brownhills local history, David Evans, Facebook, Gordon Mycock, Julian Ward-Davies, local blogs, Local History, Old Leopard, Old maps, Pubs, Sandhills, Staffordshire, Stonnall, The Leopard, Walsall Wood, White's directory 1834. Bookmark the permalink. Hello, The Leopard in sandhills is the Leopald and not the Old Leopald, the plaque states its old as in the past! The Old Leopald was in Shenstone if you look at White`s dir of 1834, there is no key number next to the name Old Leopard, so that means its in Shenstone. Well thats the way I see it, before my medication! please , a thankyou to Howmuch for his observations. I wonder, does the White’s directory show a key number by the ( Lichfield Road, Sandhills) Leopard at all, to show that whilst it is in the Shenstone Parish, it is not in Shenstone village? Interestingly, the various census records show that different entry criteria have evolved/ improved over the last 170 years or so. David…………now for a glass of tincture and a quiet lie down ! Hello David, yes the Whites dir 1834 shows the number 13 next to The Leopard, and on the list it shows: 13, Sandhills. for How much.. please many, many thanks, you are a star. 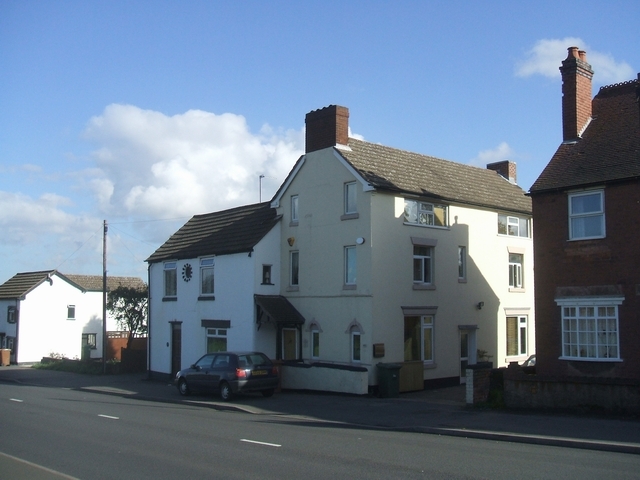 My wife whose family are from a house nearby ( and can date their family back to pre-1800 there) can let go of my left “ear” now, and put it back to its original shape..
1841 Census, Shenstone, at Leopard Inn, John Titterton, 60, Victualler. (Class: HO107; Piece 980; Book: 14; Civil Parish: Shenstone; County: Staffordshire; Enumeration District: 18; Folio: 25; Page: 13). Preceding record is Lawrence a shepherd at Old Stables. Then Shenstone Mill, Shenstone Hall, 3 households, Bulls Head Inn, Charles Wilson, 30, Victualler. Going the other way there are no obvious landmarks on the next two pages. This Leopard Inn is obviously nowhere near Sandhills. The decription of the census district (18) ends with “Hence to Lawton Grange Farm, Shorthouses House, and up to Streethay House and thence along the Leopard Lane to Shenstone Mill”. I note there are some Leopard Cottages marked on the 1974 OS map near the mill. Streethay Lane was then known as Leopard Lane? 1851 Census, Shenstone Village, John Titterton, 68, widower, labourer. So not running the inn then. Next door Joseph Titterton (son?) shopkeeper and farmer. No reference to inn or mill, but Stables are listed. The Staffordshire Archaeological and Historical Society Lichfield 2009 “the Old Leopard, no 256 ; just north of Shenstone Mill (owned by John Titterton who also owned a small croft, C179). The Old Leopard was therefore in or part of the buildings where Mill Lane and Streethay Lane meet? Sorry, I meant Mill Lane and Streetway Road. many thanks, Andy..Ancestry is a dawdle.. and ..it puts years on me! Thanks for your kind research and for clearing this up! You must remember boundaries. Stonnall was split into lower Stonnall and Stonnall, Lower Stonnall went into brownhills as we know it today by the the old macdonalds.Stonnall joins onto shenstone today, the question needs to be asked how far did Stonnall boundaries go back in 1830’s. Yes! thanks – the other commentors nailed it at the time. yes please! What a very kind offer !